Over the last 20 years there has been considerable evidence which shows that the build up of greenhouse gases such as carbon dioxide has grown due to human activities. If nothing is done about this increase in rising global temperatures then sea levels will rise and which in turn will alter local climate, rain forests, crops and water supplies. It could also affect our own health and that of animals. Many ecosystems will be greatly affected and disturb the natural balances that are already incredibly delicate. Climate Control model simulations suggest that by 2100 average surface temperature will have increased by 2.5°C. Killer heat waves will increase and there will be an increase in flooding. Sea Levels could rise by 49cm over the next 100 years. Further melting of the arctic ice caps will prevent the Gulf Stream from providing the UK with warmer waters. 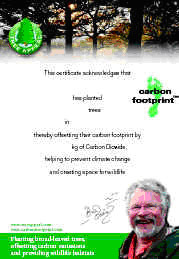 An organisation called Carbon Footprint has teamed up with Tree Appeal. Trees will be planted to absorb CO2 and assist in the rehabilitation of global warming. Each tree planted can breathe in about 730 kg CO2 emissions over its lifetime. It's estimated that the average person needs to save about 7,000kg of CO2 per year. This scheme is endorsed by Bill Oddie, the TV Wildlife celebrity. We at Progressive Resources have pledged to plant a tree for every event that we organise. Planting just 10 trees each year as a minimum is just one strategy for aiding the relief of global warming. The trees planted will also provide natural habitat for wildlife and small ecosystems. Each tree planted can Breathe in 730kg of CO2 in its lifetime. The calculations are simple and benefits are substantial. Below is a list of a few simple cost effective steps that you can do immediately to help reduce the level of emissions and help reduce global warming. 5. Check the central heating timer - there is no point heating the house when your not in it. Other ideas for reducing global warming which may cost at first but will pay off within 3-4 years. 4. Replace fridges and boilers if they older than 15 years. New ones have an energy efficiency rating of A.
Travelling can also add to Global Warming, these are some ideas to reduce your travelling emissions. 6. Consider replacing your car with a diesel engine. You can even make your own Bio diesel fuel. 8. When you leave your hotel room, turn the air conditioning and lights off. Finally a few additional tips for reducing emissions caused by secondary carbon footprinting. 2. Try growing your own fruit and vegetables rather than buying them. Think about your footprint at work too? Do you turn lights off? Print on both sides of paper? Leave your computer running? If you do then try and remedy all of these and help with reducing global warming.